The Peoples Climate March, is being billed as a mobilization for climate, jobs and justice. Dennis Creech came to Washington, D.C., from Atlanta. He told NPR's Jim Kane that saving the climate should not be a partisan issue. "Who doesn't want clean air? Who doesn't want clean water? Who does not want abundant, non-polluting energy?" Some common signs read, "Save the EPA," and "Save the Climate, Change the President." 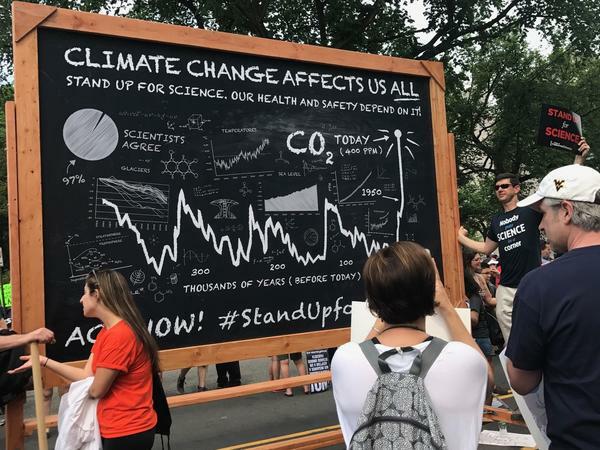 Saturday's event was inspired by another rally nearly three years ago, when several hundred thousand marchers filled the streets of New York City in what organizers called the largest climate rally ever. They were demanding action at a United Nations Climate Summit. Since then, it's been a roller coaster ride for activists worried about global warming. In December 2015, the U.S. joined nearly 200 other countries to sign the Paris climate deal, aimed at keeping temperature rise within a somewhat safe level. It was considered one of the major achievements of Barack Obama's presidency, and the capstone of a series of policy shifts aimed at reducing carbon emissions and avoiding the worst impacts of climate change. The march comes on the symbolic 100th day in office for President Trump, who denies climate change and has called it a Chinese "hoax." Trump has vowed to revive the coal industry, one of the nation's main sources of greenhouse gases, and issued a series of actions ordering his administration to undo every climate regulation it can. "I don't think, truthfully, that there's any big hope that we're going to get significant climate action out of the Trump administration," says Bill McKibben, the founder of 350.org and a key organizer of both the New York march and those today. Instead, he hopes to drive home the message to others that Trump's moves are deeply unpopular. A recent poll by Quinnipiac University finds that three-quarters of U.S. voters are concerned about climate change, and nearly as many say the president should not roll back regulations to address it. "People are outraged by that," McKibben says. "And if we make that outrage loud and clear, it will at the very least dampen the enthusiasm of the Congress of going along with this kind of nonsense." Those taking part in Saturday's march include labor unions, faith groups, indigenous peoples, and environmental justice advocates. For Emily Verna, of Washington, D.C., the size of the march was encouraging. "It's a nice way to recharge and just remember that there is this coalition that's big, and that we're going to move forward together, and there's a lot of us in the fight," she says. Organizer McKibben wants to broaden protesters' message to include support for clean energy. A couple of days before the march, he joined U.S. Sens. Bernie Sanders and Jeff Merkley as they introduced legislation with a goal of putting the U.S. on 100 percent renewable power by 2050. McKibben admits it has no chance of passing in the current Congress. But he says even Trump can't stop a steady shift to solar and wind as record low prices make them more competitive than ever. Still, McKibben says that shift will happen more slowly under Trump, and every increase in carbon emissions will cause permanent damage. "No one's got a method for refreezing the Arctic, or for bringing coral reefs back to life," he says. "What Donald Trump is costing us is time, and time is the thing we have the least of in the middle of this emergency."